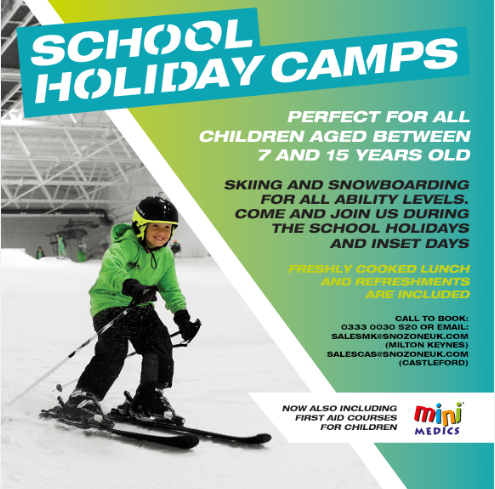 Offering two indoor real snow slopes, open 364 days a year and situated within easy reach of London, Leeds or Manchester, Snozone Milton Keynes and Snozone Castleford are unique venues for filming. We have a history of working with a variety brands such as Hyundai, Mitsubishi, Red Bull, Michelin and Solarplicity as well as with some of the biggest names in the film and television world. Disney, the BBC and ITV have all used our snow centres for filming over the years and we regularly host external competitions and snowsports events throughout the year. Our snow slopes can be hired from an hour to a day, a week or longer – and we have fully-equipped conference and catering facilities as well as office space available if required. Local accommodation options are plentiful and both Snozone sites benefit from excellent transport links and easy parking access for vehicles of all sizes. Photography for personal use: Whilst we are more than happy for members of the public to take photographs from our viewing areas situated within our restaurants, we currently ask that no photographs or video films are taken whilst on our slopes for health and safety reasons. All commercial photography needs to be pre-arranged and is subject to location fees. Or please call 0333 0030 520 to speak to a member of our sales team who will be able to help with your enquiry.